Chicken breasts don't get juicier or more flavorful than this—or easier to make! 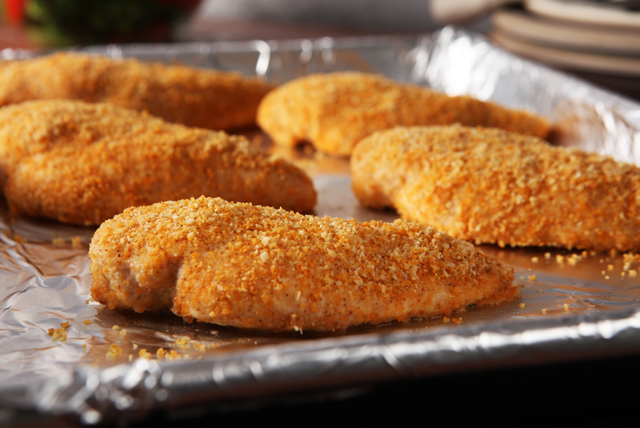 Just coat 'em in SHAKE 'N BAKE Chicken Coating Mix and grated Romano. Preheat oven to 400°F. Moisten chicken with water. Shake off excess. Empty coating mix into shaker bag. Add Romano cheese; shake gently to mix. Add chicken, 1 or 2 pieces at a time; close bag and shake gently until evenly coated. Place in foil-lined 15x10x1-inch baking pan. Discard any remaining coating mixture in shaker bag. Bake 20 minutes or until chicken is cooked through. Substitute KRAFT Grated Parmesan Cheese for the Romano cheese. Serve with prepared KRAFT Deluxe Macaroni & Cheese Dinner and steamed fresh broccoli. Substitute 1 broiler-fryer chicken, cut up, for the chicken breasts. Bake at 400°F for 50 minutes or until cooked through.